Korean Idols Have Cartoon Character Doppelgangers? 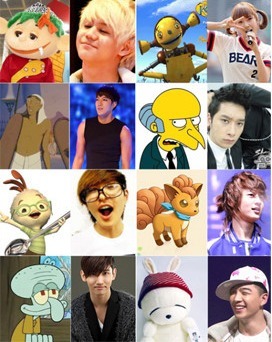 Korean idols' resemblances to popular cartoon characters became a topic in various web portal sites. Which of your favorite idols have a cartoon character doppelganger? On an online community bulletin, a collage of photos titled "Character Resembling Idol" was uploaded and illustrated many popular cartoon characters of Korean and North American shows compared next to idols! Idols in the photos include 2PM's Wooyoung, 2NE1's Minzy, Big Bang's Daesung and Taeyang, BEAST's Yo Seob and many others. The most popular reactions were of Wooyoung and KT's baby robot 'Kibot' as well as SNSD's Jessica's resemblance to 'El Captain'. In addition, Daesung as 'ugly doll', Minzy as 'Strawberry', Yo Seob's 'Pocket Monster', SHINee's Minho as 'Six Tail Fox' and Taeyang as 'Mashimaro' were popular for being the most accurate for facial features! Netizens commented, "This is really spot on", "Daebak ~~!!" or "They really look like this kk"
Which idols were the most accurate to their cartoon?